In high school when I missed school due to illness I did a show called "The Will Drinker Show" in order to make up for the missed class time. This scene is from one I did for biology class. The focus was primarily on my disease, Hirschsprung's, but Dan is featured in it heavily as are my dad and sister. Enjoy. When it comes to my filmmaking, Dan has always been the most convenient and agreeable star. Back to the time when I first began playing with my Dad's video camera my brother was always available and willing to perform. Long before we began this project Dan was the star of the majority of my movies. DAN AND DIZZY DISCUSS "TITANIC"
This was Emily's first time voting. 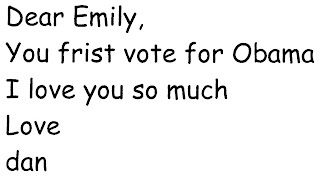 Dan's note wasn't enough to talk her out of voting for Hillary Clinton. 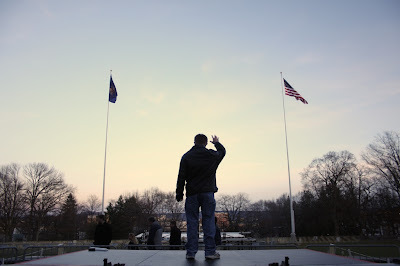 CLICK HERE to watch Dan's endorsement of Senator Obama. Directly after "breaking up" with Christine, Dan and I headed to State College, Pennsylvania to visit our friend Evan. 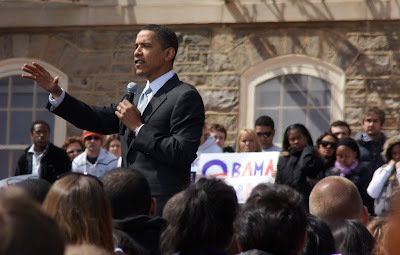 He goes to Penn State University and Barack Obama was speaking there. 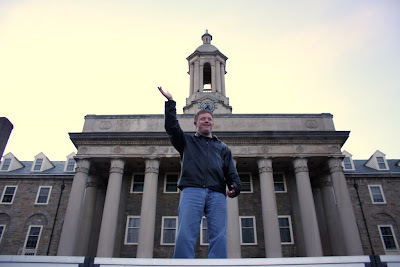 Click below to listen to Dan and Will on PSU's radio morning talk show. My stream timed out shortly into the broadcast so I was only able to record a bit of it. We were on the air for an hour. 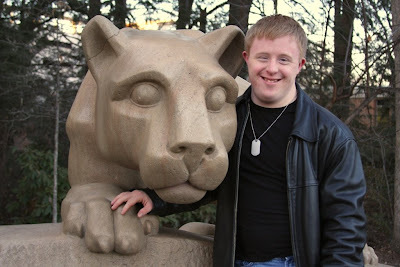 CLICK HERE to read an article about Dan in Penn State's newspaper, The Daily Collegian. Sometimes Dan likes to put on his favorite gear and head out into our street with his iPod. This is not a man who is lost in his head. This is a performance. If no one is out playing, he will wander our neighborhood until he finds people outdoors to dance for. The reason the girls in the background don't seem phased is because they aren't. This is something Dan has always done and something we have always enjoyed watching. His iPod contains a variety of music. He most exclusively listens to the High School Musical soundtrack (both films). He also frequents Elvis Presley, The Blues Brothers, Michael Jackson, The Beatles, The Bee Gees, the West Side Story soundtrack, Jay Z, Usher, Nelly, Cool and the Gang, Run DMC, The Temptations, The Supremes, Carole King, James Taylor, and his sister, Emily Drinker. Dan and I recently spent some time searching You Tube for his favorite dance songs. You can find our favorites on right right side of this blog under "Let's Dance!". Fair warning, be prepared to dance. Dan, Emily, our mom, and I were dancing in my room to "Boogie Nights" only moments ago. It could happen to YOU. I wrote this song a few days ago and recorded it with my sister last night. It is just a demo. Soon, we hope to re-record it more professionally. Let us know what you think. To play the song click the pink circle below. Dan and I used to play a speech game called "The Word of the Day". On this particular occasion, Emily was filming, I was dong my best Alfred Hitchcock impression, and the word was "Celtics". leaving only the mark of pleasure. Your first year is full of memories. Unending feedings, monitor wires, false alarms. And then off to KEN-CREST. Your second year of crawling and then learning to stand. Your love of yogurt in a variety of flavors. with a strut like no other. Your love affair with applesauce. dramatic improvement of verbal communication. Potty training, the hits and misses. your wonderful relationship with your brother, William. You muster courage and try. You have accomplished with pride numerous goals. You made us look at the world differently. You gave us permission to cry in public. You bring great joy and sometimes it runs down our cheeks. You are the best thing that ever happened to us! 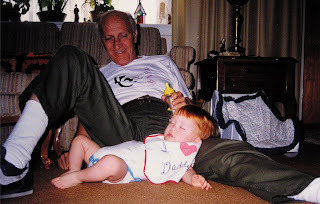 Dan and his grandfather, Arthur Freedman. 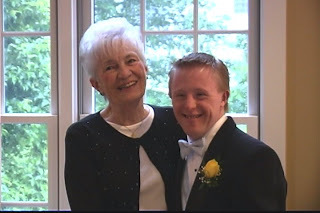 This montage is part of a video I made Dan for his high school graduation. Our father shot all (well, most) of the footage (before he gave me the camera for good). Watch Dano grow up to a song that might has well have been written just for him. Two more songs from Dan's graduation video. Two of his favorites.